How will this brand audit template help me? For digital marketing communications to be effective, they need to clearly highlight the unique, differentiating benefits of the brand they are promoting, whether this is a brand related to a company, product or service. 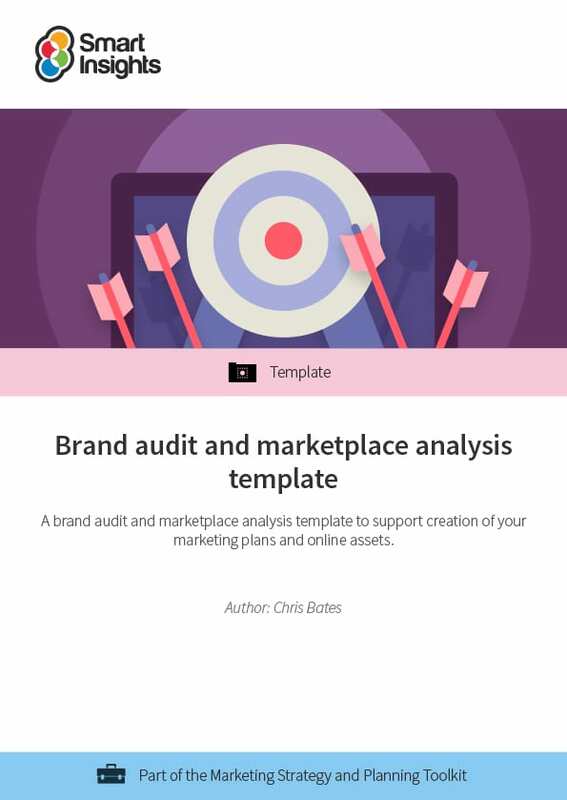 This audit template will help you create a marketing plan and also when reviewing branding for websites and other digital media assets such as landing pages where the differentiating brand values need to be defined. The template is not specific to digital channels, it summarises broader business and branding aims. We've created it to help marketing consultants, agencies and for internal reviews between a digital marketing specialist in a company and other marketers. It was created as an efficient way of supporting the creation of briefs from small and medium business owners or marketers as part of projects for digital marketing strategy including website improvements. Owners and managers of small to medium sized businesses who are directly involved with the day to day marketing processes. Marketing consultants or agency account managers involved with client discovery and completing audits. What does the branding template review include? 2. Customer and market analysis. 3. Brand including creation of different brand models such as the Brand Onion. 4. Industry and market sectors. 7. One page brand audit summary. “Brand” is often taken to just mean brand identity. But branding is much more than the identity as indicated by the logo, colours and typography. Branding also requires you to review your key audiences and how they perceive your brand proposition compared to competitors. The aim of this template is to support a brand or marketplace audit process where a company needs to summarise or review their brand values and marketplace position as part of creating a marketing or brand strategy. This review may also be performed by a consultant or agency or when teams are collaborating within a larger company. Authors: Created by Digital Marketing Strategy consultant Chris Bates. Edited by Dave Chaffey. Format: 18 A4 page unbranded Word document template for you to amend with one page brand summary for a rapid review. Individual and Business members get full access to this and 5 other guides in the Marketing strategy and planning Toolkit.